of Dr. Padraigin W. Thalmeus, PDS. Every town has myths, but not every town has monsters. Reston, Virginia could be the most monstered town in all the world! At least according to the recently unearthed journal of the scholarly yet skittish Dr. Padraigin W. Thalmeus, PDS., circa 1819. Join our team of modern day paranormal researchers as we discover the supernatural creaturesa banshee, sea monster, ghosts, troll, Sasquatch, The Bunny Man, and much morethat Dr. Thalmeus faced on his perilous quest for a legendary hidden treasure. 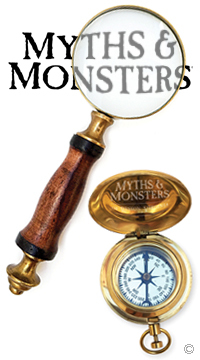 Find out if these myths and monsters are still haunting to this day! 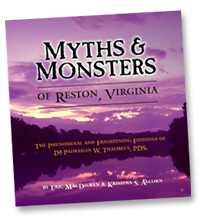 And you don't have to live in Reston to enjoy the book series. The myths, legends, creatures and tales will be exciting to all readersno matter where you call home! Check out some of great reviews and magazine articles! Content, images, and illustrations © Eric MacDicken. Photographs used with permission © Caroline Schor-MacDicken.